Twisted Kiss Socks - monemades Webseite! And yet another pair of my friendship socks arrived in its new home in the States - Shelley found them in her stocking today. The yarn is by another one of my (so far only virtual) Ravelry friends, Laurel, SpinningFates. 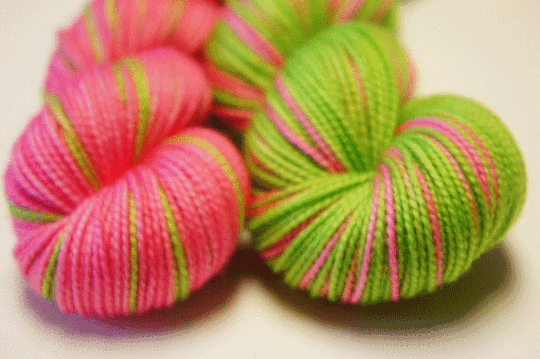 She dyes beautiful yarns and her 'Twisted Sisters' is an adorable self striping yarn line. The yarn has been dyed so that when knit into a pair socks (one sock from each skein) the stripes will be opposite of each other. Well, anyone who knows me knows that I hardly ever knit 'plain vanilla socks', so Shelley's socks are patterned to and I like the fun effect how it breaks up the stripes.